A great chain in its own right, this item is also an awesome back-up for our most popular footage cable chain 21018F. The 1.4mm open links can easily fit attachment jump rings for links or embellishments. 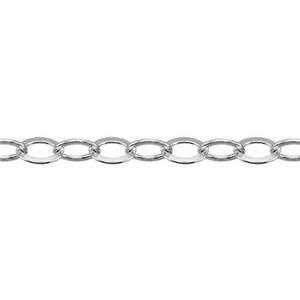 The flat links have more surface area to reflect light and give this chain an eye catching sparkle. A basic cable that will not steal the limelight from your focal pieces.This is a great canvas for your jewelry designs.